Almost a year to the day since I reported that the 70m motor yacht Reverie had come on the market with Michael White and Peter Thompson at Ocean Independence, comes news of a $10 million price reduction. At the time of her build in 2000 she was the largest superyacht by tonnage built by Benetti and, despite her size, Reverie sleeps just 12 guests for charter in eight cabins with a further two cabins available for personal staff. A major attraction though, is that she can accommodate 18 to 24 guests for private use. Internally, her six decks (all united by a lift) include one that is largely devoted to the owner. This includes a master suite that revels in a magnificent bedroom with panoramic forward views over the private terrace, sumptuous his and hers bathrooms and vast walk-in dressing rooms. The deck also offers two further family cabins (each with a double and a single bed), a study, an owner’s saloon and a circular inside-outside dining room. Of the remaining guest cabins, four are identically sized double cabins with en suite bathrooms situated on the lower deck and an impressive VIP cabin, which occupies the forward element of the main deck superstructure. 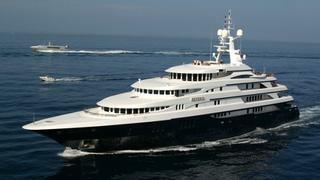 Lying in Genoa, Reverie is now asking $65 million.